This is the characteristic bird of fast-flowing rivers and streams, and is normally found only in Cheshire in the eastern hills. The breeding distribution map shows a reduction from 36 occupied tetrads in the First Atlas to 22 now. It is not possible to track their contraction in range because Dippers have been notoriously poorly recorded in the annual county bird reports, as the following quotes illustrate: just four years after our First Atlas period, ‘there were no confirmed breeding records’ in 1988, and by 1992 ‘there were no breeding records’ at all. Richard Blindell single-handedly rectified this in 1994 by locating at least twelve territories along about 10 km of the meandering River Dane from Hug Bridge (SJ96G) to Congleton (SJ86R), but again by 1997 the species was ‘under-recorded’ and in 2002 ‘breeding was not confirmed from any site in the county’. This Atlas stimulated more thorough recording of Dippers: fieldworkers confirmed breeding in 13 tetrads, recording NY – nest with young – in 4 tetrads, recently-fledged young (RF) in 8 tetrads and one instance of an adult carrying food for its young (FY); pairs were observed in another three tetrads and single birds in six. Not surprisingly, all of the submitted habitat codes were G6 ­– stream (less than 3m wide), with 12 records, or G7 ­– river (more than 3m wide), with 10 records. There is no clue from the national picture that might explain a decline in the species in the past twenty years. Dipper populations on the BTO’s Waterways Bird Survey plots have fluctuated over the last thirty years, but shown little overall trend. The birds are a sensitive indicator of acidity and other water pollution (Tyler & Ormerod 1994). Dippers use their sharp claws to grip onto the riverbed whilst they walk about underwater finding food. Adults eat a lot of shrimps, and feed their young chicks mainly on mayflies or stonefly nymphs, with caddis larvae increasingly important as the chicks grow. According to monitoring by the Environment Agency, the biological quality of east Cheshire’s watercourses is deteriorating. Their most recent assessments (2004-2006) place the River Dane (SJ96S), Clough Brook (SJ96T), Bosley Brook (SJ96C) and Pott Shrigley Brook (SJ97P) in category C (fairly good), all having been category B (good) a few years earlier. 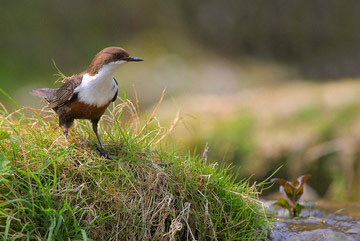 Most Dippers are monogamous, and often pairs stay together for several years. To reinforce the pair-bond both sexes sing at almost any time of year, although their sweet, rippling notes are often drowned out, to human ears, by the noise of the water, and there were no Atlas records of song. Dippers start their breeding activity in winter and invest a lot of time in their nest, perhaps taking a month to build a large, domed structure over running water, on a ledge, natural or man-made, and sometimes even behind a waterfall or in a culvert. They start laying in March or early April, having advanced this date by about nine days in the last forty years. Their four or five chicks are flying during May; their early start allows Dippers to refurbish the nest and raise a second brood in July, although perhaps only one quarter of pairs do so (Tyler & Ormerod 1994). Although almost all breeding Dippers have been in the eastern hills, especially along the Rivers Dane, Dean and Goyt and their tributaries, occasional birds have been found in the lowlands, including a series of records during the 1970s from the Cuddington Brook (SJ57W), with proven breeding in 1975; in 1982 a pair hatched young on the Wych Brook in SJ44M; and in 1994 Dippers bred near Haslington (SJ75H). The 1994 survey of the River Dane found territory lengths less than 1 km, and the typical range is from 0.5 km to 2.5 km (Tyler & Ormerod 1994), so each tetrad could hold from 1 to 5 pairs. With 16 tetrads recorded with confirmed or probable breeding, there might be 25-30 pairs of Dippers in Cheshire. In 2007 South Manchester Ringing Group started a research project ringing, colour-marking, mapping territories and nest-sites and measuring water quality. Within our county boundaries, their members found 12 nests in 9 tetrads, with probable breeding in another two tetrads and possible breeding in one; four of these twelve tetrads are blank on the Atlas map. We should know much more about Cheshire’s Dippers in the next few years.